This photo was taken from one of the dikes running through the Emerald Marsh near Eustis, FL. 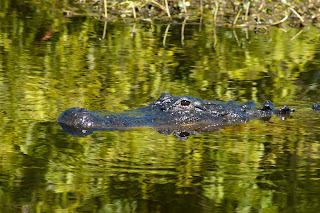 This gator was very interested in watching me set up the tripod and photographing some of the wading birds along the edge of "his" canal. I prefer the full frontal view of the gators with just the eyes and nose out of the water but I found the reflections interesting here. The marsh water levels are a little higher than a couple of months ago but still below the historical average. The gators are a little more confined in the deep canals making it easier for me but, more importantly, a bit more difficult for them to find sufficient food.